The Starry Bob (Iambrix stellifer) is a forest butterfly and is rarely seen in urban areas, unlike its close cousin and lookalike, the Chestnut Bob (Iambrix salsala salsala), which is more common and widely distributed. It can be distinguished from its more common relative by the spot on space 5 of the hindwing, which is placed midway between the cell end and the termen of the hindwing. The underside of the forewing apical area is also distinctly orange tinged in most individuals of the Starry Bob. This shot of a newly eclosed Starry Bob taking a drink at a pool of water and its reflection makes an interesting composition. 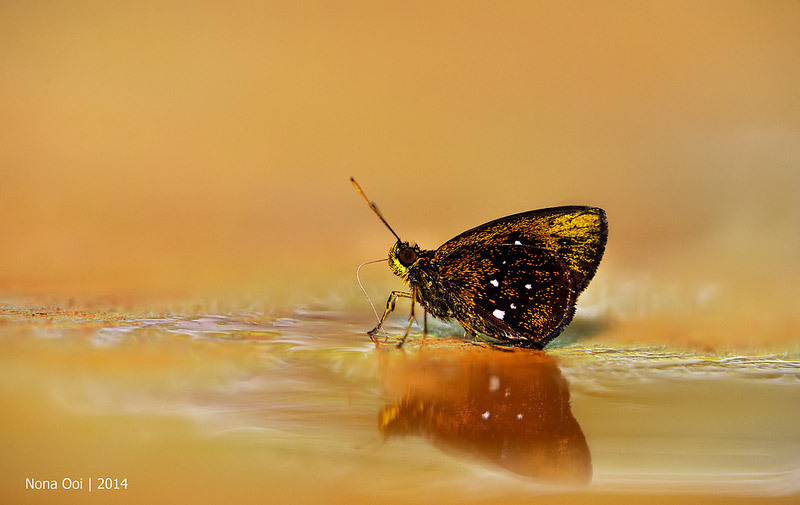 The orange background adds to the shot that ButterflyCircle member Nona Ooi managed to take on an outing in the nature reserves of Singapore.